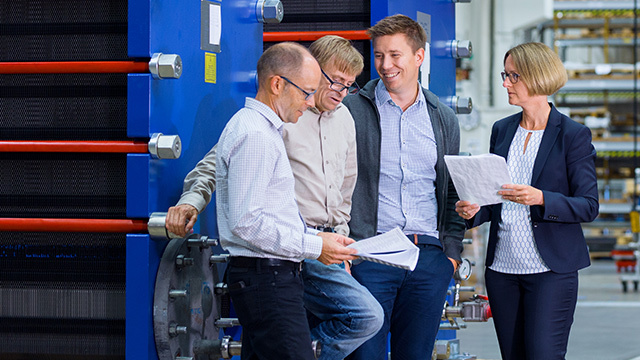 After years of research and testing, today Alfa Laval can offer the world’s most modern gasketed plate heat exchangers for industrial applications. Packed full of features unique to Alfa Laval, these new designs combine our latest innovations with the best technology developed from decades of experience as a world leader in thermal solutions. This next generation promises to redefine efficiency, reliability and serviceability in industrial heat transfer. With the launch of the next generation gasketed plate heat exchangers, Alfa Laval extends and upgrades our high performing Industrial line and Industrial semi-welded line with new models and features specially engineered to create even more opportunities in industrial applications. The Alfa Laval Industrial line is a versatile range with numerous options to fit all types of industries and applications. The many options in size, plate configurations and gasket materials ensure a perfect fit for your demands. And if your needs change, the flexible design makes it simple to expand or reduce the plate package to meet the new duty requirements. Every detail is carefully designed to ensure optimal performance and flexibility to meet specific application needs. The Alfa Laval Industrial semi-welded line is a high performing range designed to resist high pressures. extreme temperatures and hazardous media. It offers a reliable solution for refrigeration applications, safely handling most refrigerants including ammonia. In chemical processing, the semi-welded solution offers a high performing, media separated solution with no risk of cross-contamination. The next-generation range of gasketed plate heat exchangers is filled with ground-breaking solutions that set new standards in thermal efficiency, mechanical reliability and ease of serviceability. These features are part of what sets Alfa Laval apart – you won’t find them anywhere else. Select a feature to learn more about the benefits it can offer in your production. Alfa Laval offers a wide range of gasketed plate heat exchangers tailor-made for specific application areas and industries. Alfa Laval Industrial line for heating and cooling duties in both utility- and more complex applications, offers a versatile and flexible heat transfer solution to most industries. AHRI-certified AlfaQ™ heat exchangers for general heating and cooling duties are certified according to AHRI Liquid to Liquid Heat Exchangers (LLHE) certification program ensuring thermal performance according to specification. The Alfa Laval Industrial semi-welded line is used when gaskets are not suitable for one of the media or when higher design pressures or temperatures are needed. For dairy, food, beverage and other hygienic applications, Alfa Laval can supply a wide range of heat exchangers. Learn more about our BaseLine, ClipLine, FrontLine and M line gasketed plate-and-frame heat exchangers. Alfa Laval WideGap is suitable for fibrous fluids and fluids containing coarse particles. Alfa Laval AlfaVap rising film plate evaporators is suitable for media with high concentration and viscosity. Alfa Laval AlfaCond plate surface condenser for condensation under vacuum. The Alfa Laval Diabon ® with graphite plates for tough and corrosive media.